Dash mounted heater controls refurbishment. The heater controllers were stiff and not able to be moved very well. The chrome was pretty poor looking and needed to be replaced or so it seemed. So I decided to take it apart and see what was what. The idiot had cut the electrical connections to the electrical plug and some of outer cable was damaged by the mini fire under the dash. The cable from the controller go to three points on the Plenum which controls the heat, speed, and air directions. It’s a mechanical connection of a cable within a cable that physically moves the levers around. The cables need to be dis connected from the plenum first and pull the electrical plug from the front of the plenum. You can remove the dash ashtray to give you a little light around the area. The chrome plate holds the cables and the electrical switch, this in turn is held to the dash by only two bolts in opposite corners. In the other two opposite corners there are location pins. I found a flexible shaft on a socket was the best way to undo the two bolts. There is a locking washer in place so needs a quick twist to crack the nut and washer free. Once the bolts are removed the mounting bracket can be removed from the bolt on the chrome plate. gently tap the plate free and pull away from the dash. Pull the operating cables and the electrical wire through the dash. The levers have fittings on the end which are held in place via an Allen grub screws. Make sure you have a good fitting Allen key to remove them. Remove the operating cables from the back of the levers. Note the length of the cables and their position as they are different lengths. Once the fittings are removed from the front, the reverse side of the plate has two more bolts that holds the switch in place along with the front plate. Undo the two bolts and the front plate will come of leaving the lever mechanism. Cleaning is a case of degreasing and cleaning. If you wanted to go a step further there is a sprung clip that holds the mechanism together. All the parts have a number one to four and this is the sequence that the lever, plate, and two more levers are fitted. I didn’t notice this until the levers were cleaned up. but I have taken a photo of them to show the locations. I used degreasing agent to clean the mechanism and remove the old grease. Chrome cleaner was used on the levers. The cables were cleaned up and the damaged outer plastic case on the cable was wrapped again with tape to neaten it up. I added Gibbs Lubricant to one end of the cable and worked the inner wire to make sure it was free. I allowed the capillary action to soak all the way down. 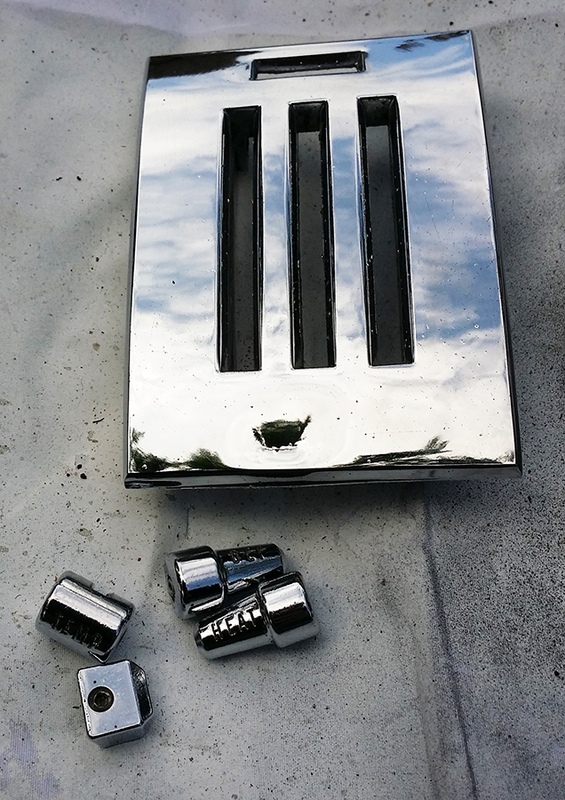 I cleaned the back of the chrome plate with degreaser again, then the front was polished with chrome cleaner along with the fittings. The fitting is again the reverse of the removal. At this point I didn’t grease the parts up yet. Check the switch is working correctly at this point, if it’s not now is the time to replace it. Fit the mechanism to the back plate and then align the switch to the plate ensuring the locating pin is in place for the correct position. The levers and the top switch can be a little fiddly to align up correctly. Once in place tighten the two rear bolts. The wires at the end of the operating cables fit through holes and lay flat against the clamp brackets. I found it easier to insert the second cable then the longest then the shortest. Make sure the cables are laying flat along clamp and the inner wire moves freely. Add the clamps and tighten up. It might be a good idea to take a photo of the location of the cables to make it easier to line up with the plenum later. With everything back in place the completed item should look a little like this. Again slide the cables back through the dash making sure the cables do not snag any wires and are clear from the wiper arms. Fit the clamp to the dash and reach inside to attach the brackets onto the bolts. Add the locking bolts and tighten up. Clip each cable onto the plenum and tighten the clamps up that hold the cables in place. There may be some fiddling around to make sure the full operation is achieved. I am well pleased with the way this has come out. The cables are silky smooth now and the full movement of the levers now works. Thanks for good explanations and pictures – amazing finnish You ended up with . I’ve got a 65 HT , bought a year ago . I do some work on it myself and suddenly found out that the cables from the 3-lever heater control was missing . I’m trying to find out and understand where “Heat” , “Temp” and “Def” are connected ? I think “Def” goes to the box with the two upgoing hoses ?